We went to Antarctica to understand how changes to its vast ice sheet might affect the world. Flowing lineson these maps show how the ice is moving. Ice sheets flow downhill, seemingly in slow motion. Mountains funnel the ice into glaciers. And ice flowing from the land into the sea can form a floating ice shelf. Glaciers in certain areas have been undercut by warmer ocean waters, and the flow of ice is getting faster and faster. This is the first of three dispatches from a New York Times reporting trip to Antarctica. THE ACCELERATION is making some scientists fear that Antarctica’s ice sheet may have entered the early stages of an unstoppable disintegration. Because the collapse of vulnerable parts of the ice sheet could raise the sea level dramatically, the continued existence of the world’s great coastal cities — Miami, New York, Shanghai and many more — is tied to Antarctica’s fate. 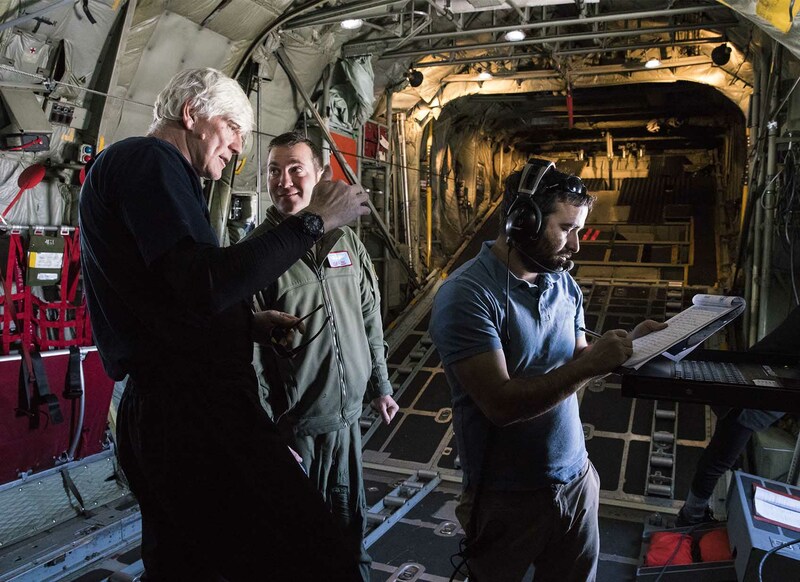 Four New York Times journalists joined a Columbia University team in Antarctica late last year to fly across the world’s largest chunk of floating ice in an American military cargo plane loaded with the latest scientific gear. Inside the cargo hold, an engineer with a shock of white hair directed younger scientists as they threw switches. Gravity meters jumped to life. Radar pulses and laser beams fired toward the ice below. On computer screens inside the plane, in ghostly traces of data, the broad white surface of the Ross Ice Shelf began to yield the secrets hiding beneath. Nicholas Frearson, at left, in the cargo hold of an LC-130 Hercules. A rapid disintegration of Antarctica might, in the worst case, cause the sea to rise so fast that tens of millions of coastal refugees would have to flee inland, potentially straining societies to the breaking point. Climate scientists used to regard that scenario as fit only for Hollywood disaster scripts. But these days, they cannot rule it out with any great confidence. Yet as they try to determine how serious the situation is, the scientists confront a frustrating lack of information. Recent computer forecasts suggest that if greenhouse gas emissions continue at a high level, parts of Antarctica could break up rapidly, causing the ocean to rise six feet or more by the end of this century. That is double the maximum increase that an international climate panel projected only four years ago. Alarmed by the warning signs that parts of the West Antarctic ice sheet are becoming unstable, American and British scientific agencies are joining forces to get better measurements in the main trouble spots. The effort could cost more than $25 million and might not produce clearer answers about the fate of the ice until the early 2020s. For scientists working in Antarctica, the situation has become a race against time. Even as the threat from global warming comes into sharper focus, these scientists understand that political leaders — and cities already feeling the effects of a rising sea — need clearer forecasts about the consequences of emissions. That urgent need for insight has led scientists from Columbia to spend the past two Antarctic summers flying over the Ross Ice Shelf, a floating chunk of ice larger than California. The Ross shelf helps to slow the flow of land ice from Antarctica into the ocean. Compared with other parts of Antarctica, the shelf seems stable now, but computer forecasts suggest that it might be vulnerable to rapid collapse in the next few decades. The project to map the structure and depth of the ice shelf in detail, funded by American taxpayers through the National Science Foundation, puts Columbia and its partner institutions on the front lines of one of the world’s most urgent scientific and political problems. Remote as Antarctica may seem, every person in the world who gets into a car, eats a steak or boards an airplane is contributing to the emissions that put the frozen continent at risk. If those emissions continue unchecked and the world is allowed to heat up enough, scientists have no doubt that large parts of Antarctica will melt into the sea. In the immersive video below, a military cargo plane flies over the edge of the Ross Ice Shelf. The orange and gray pod beneath the window will map the structure of the shelf with radar, a laser and other sensors. Click and drag your mouse to explore. Antarctic Dispatches is a three-part series from the seventh continent. Written by Justin Gillis. Maps and graphics by Derek Watkins and Jeremy White. Photographs by Jonathan Corum. Video by Evan Grothjan and Graham Roberts. Additional production by Gregor Aisch, Larry Buchanan and Rumsey Taylor. Experience what it’s like above and below the Antarctic ice in virtual reality, or read the story behind our reporting trip. Sign up to receive our in-depth journalism about climate change around the world.